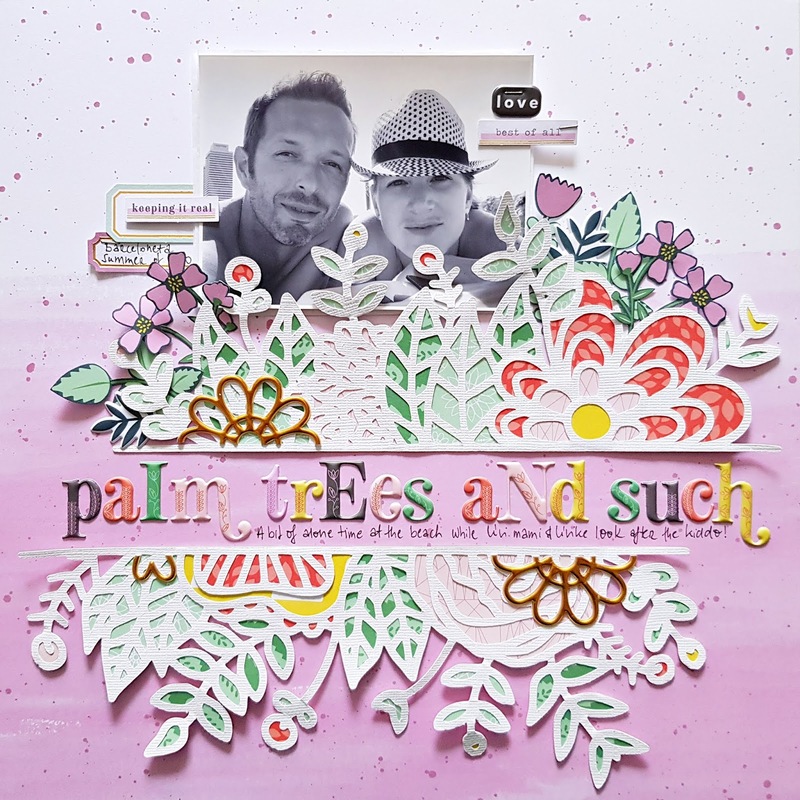 I'm sharing two new layouts today that I've created with the stunning Everyday Musings collection from Pinkfresh Studio. The first one I created as soon as Paige Evans posted this new split image cut file, Flower Borders! I've made several layouts like this before but not in a long time, and it reminded me how much I love it. 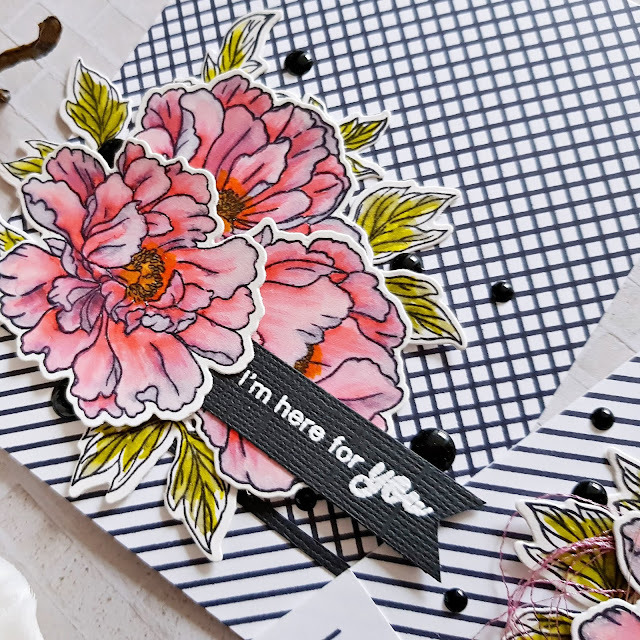 There are actually a couple of Pinkfresh stamps and dies that are like this, for instance the Lush Greenery stamp and die sets or the Bloom stamp and die sets. I made one of my favorite cards with the Lush Greenery set, you can check here. I cut the designs from white, textured card stock and backed them with various patterned papers from the collection, to bring in as many colors as possible. I love colorful things! Once done, I figured out the placement and glued the two cut files down onto the Sweet Escape paper I selected for background. I created my title using the wonderful, wonderful puffy alphas! Originally it would have been Palm trees and sandy feet but I didn't have enough space haha! Just look at those alpha stickers! Perfection! The design, the colors, the font, all of it! I then went through all embellieshments and selected some that I thought would fit: mainly labels and stickers. 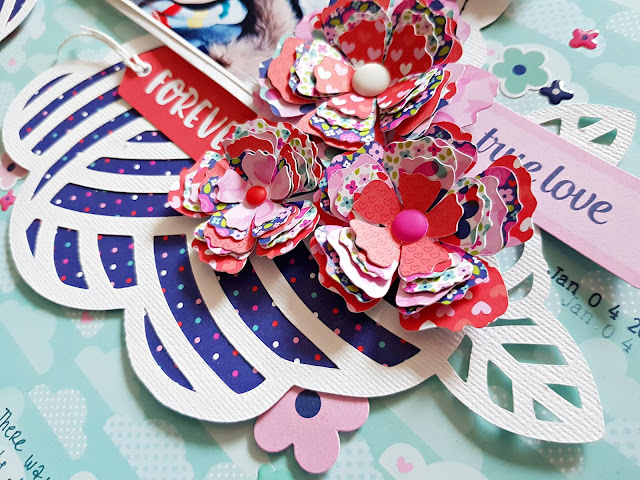 I also fussy cut some flowers and leaves from the Beautiful patterned paper and tuck these in behind the cut file. I cut apart some of the gold puffy flowers and placed them on each side of the cut files. To finish off my layout, I added my date and journaling. I wanted to go with a different color scheme on my second layout and use some of the blue papers which I haven't used yet. 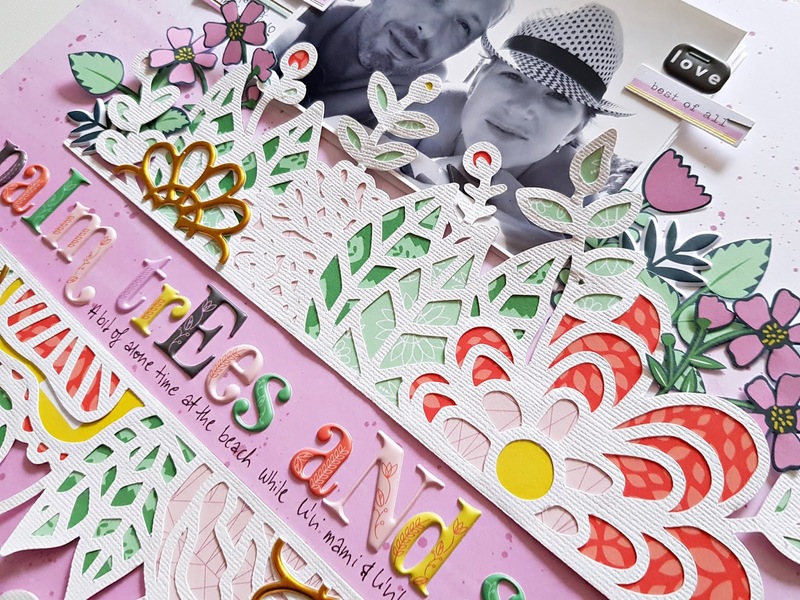 I chose a beautiful floral cut file from Handipaper and cut it twice. I wanted to nest my photo in between the two cut files. 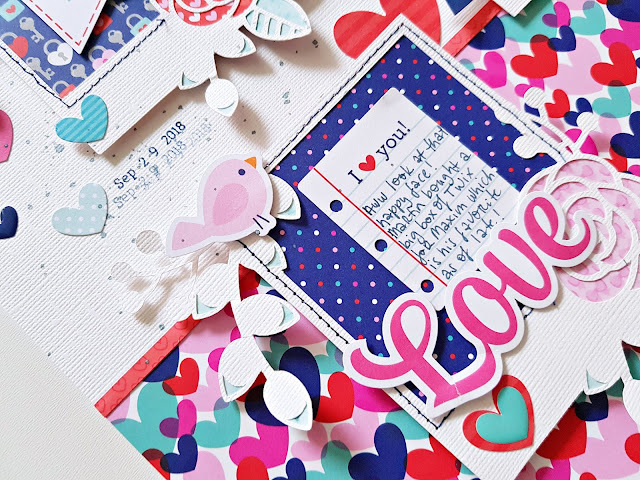 I backed them with mostly blue and red patterned papers and glued them down on the background, for which I chose the B side of the Beautiful paper. What I was the happiest about was that there were various blue and red alphas I could use! I love that color combo! I layered some of the pockets behind my photo, just to add a little bit of color. I added a few die cut pieces, stickers and a sweet little layered heart. I wrote my journaling in one of the big flower centers and stamped my date on a label tucked under my photo. That's about it! 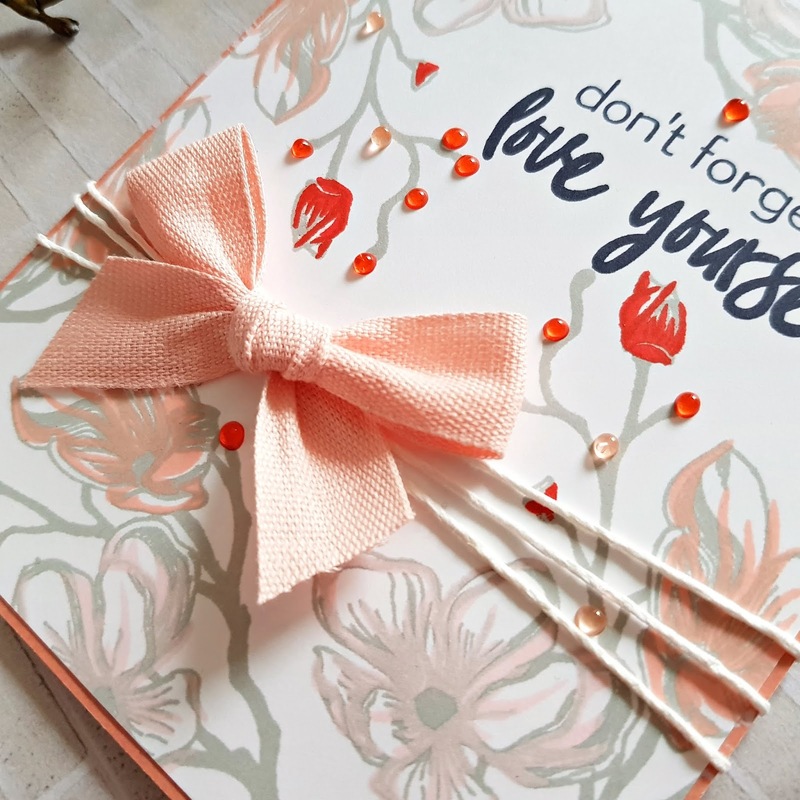 I hope you like today's inspiration as much as I loved working on them! Thanks for stopping by today! Have a fabulous day! 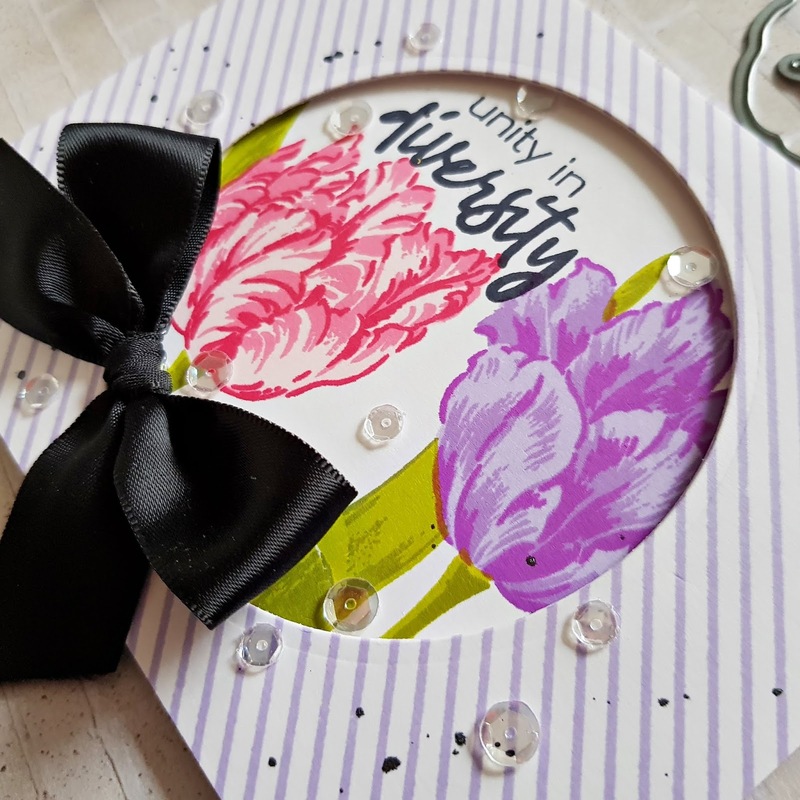 I'm so honored to have been invited by Doodlebug Designs to guest on their blog! And that with the cutest collection ever! Have you guys seen the French Kiss collection?! 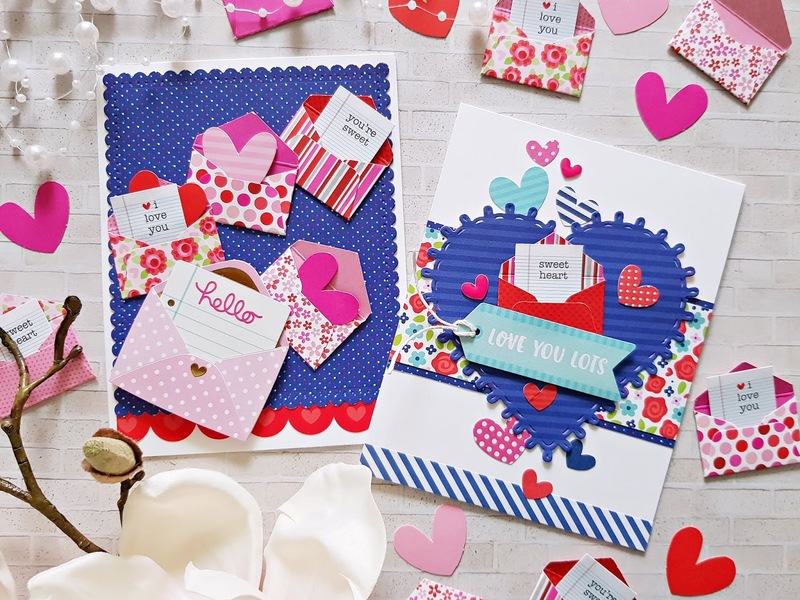 I love love love that the colors are not your typical Valentine's colors - the addition of that gorgeous blue is just fabulous! I actually had a hard time putting down the collection, I only did because I had other deadline work to do. 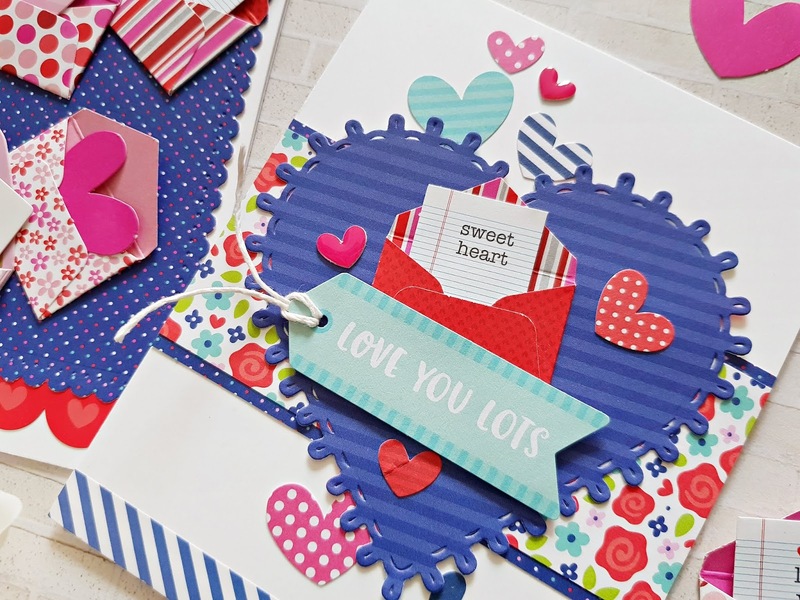 I've created 3 layouts and 4 cards for today's post. I hope you enjoy! 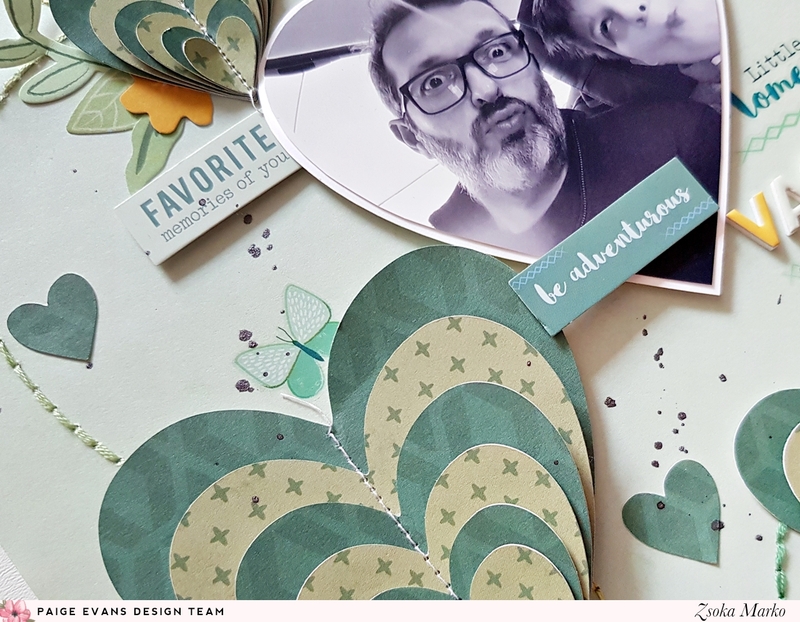 For my first layout I chose my most favorite paper from the collection. Isn't this blue just gorgeous?! 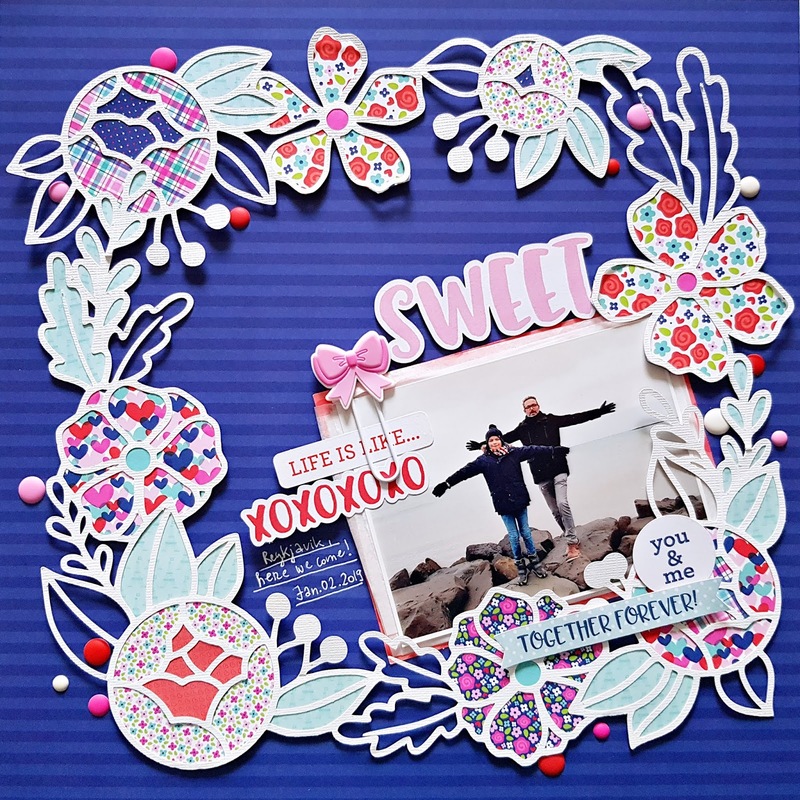 I cut the Floral Square Frame cut file from Handipaper from white textured card stock and backed some of it with various patterned papers. I added some foam adhesive to the back and adhered the cut file to the background. I layered some tissue paper and patterned paper behind my photo and tucked all this behind the wreath. I added a some embellishments around the photo, an adorable bow clip and some sentiment die cuts. I also used one of the die cuts for my title. As a finishing touch, I scattered some enamel dots around the wreath. 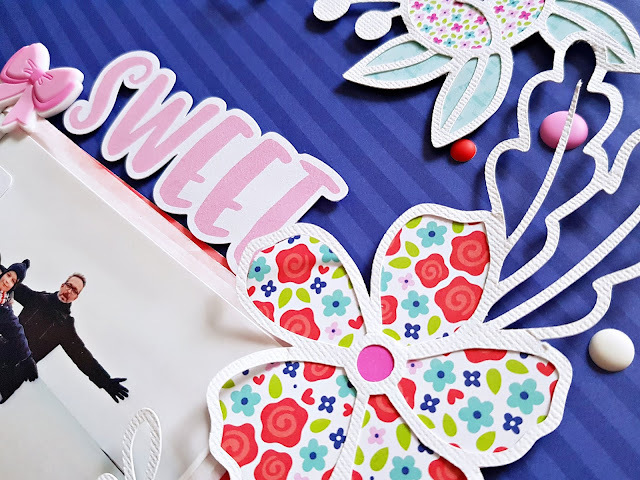 On my next layout I used the Rainbow cut file from Handipaper - I figured it would go perfectly with the cloud patterned paper! I desperately love dimension and 3d flowers! 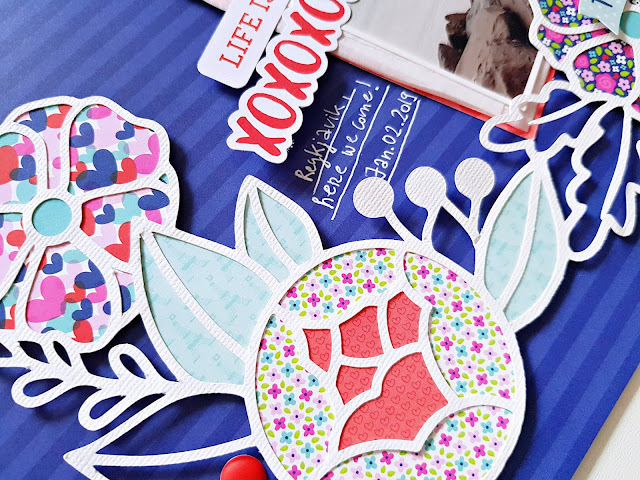 I die cut 3 layered flowers (cut file is from Paige Evans) using many different patterned papers to showcase more of this lovely collection! I added enamel dots for the flower centers. I backed the rainbow with patterned papers as well and glued it down on my background paper. I also ran my sewing machine over the rays because the white cut file didn't stand out so well. I added some tissue paper behind my photo and glued it down. To finish off the layout, I placed several die cuts, stickers and a clip, here and there. On my last layout I went with a partially white background which I don't do often! But I love that crisp white against the blues and pinks/reds, so I couldn't help myself. 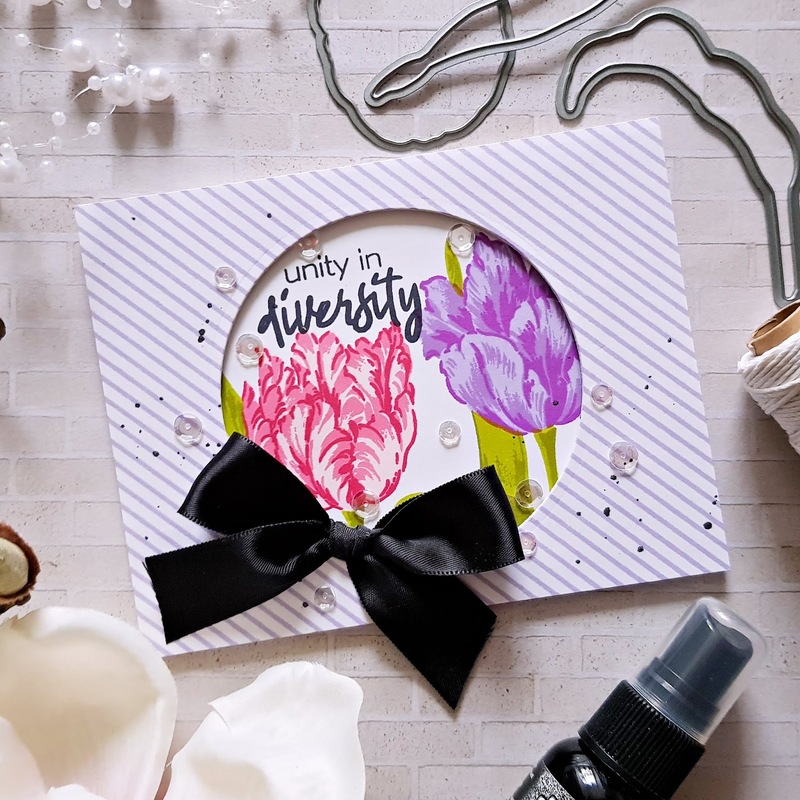 I cut the Floral Frame cut file from Handipaper in various sizes. First I backed the flowers and leaves with patterned paper, then I added a photo to the biggest and more patterned papers to the other two. I added some machine stitching to the frames so that they stand out from the background. I placed the frames on foam adhesive and glued them in place. I decorated my page with lots of die cuts and some enamel hearts. As for the cards. 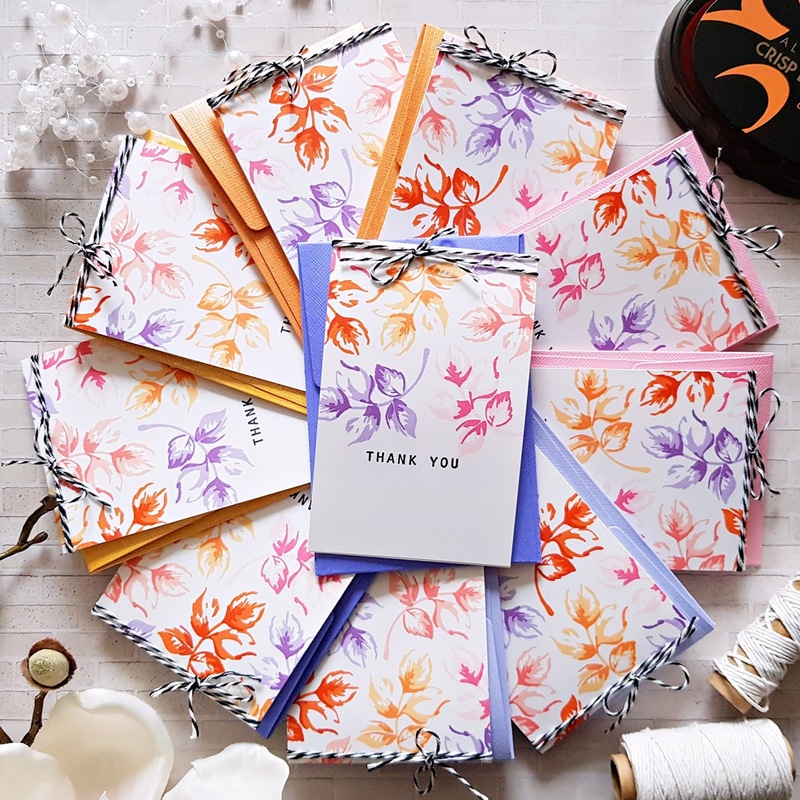 As soon as I saw the teeny tiny envelope pack, I knew I had to make some cards! Aren't they the most adorable thing you've seen?! The bigger envelope on the left is a layered sticker, that comes in a different pack. The tiny ones come flat on sheets, you have to assemble them, but that takes like 10 seconds! 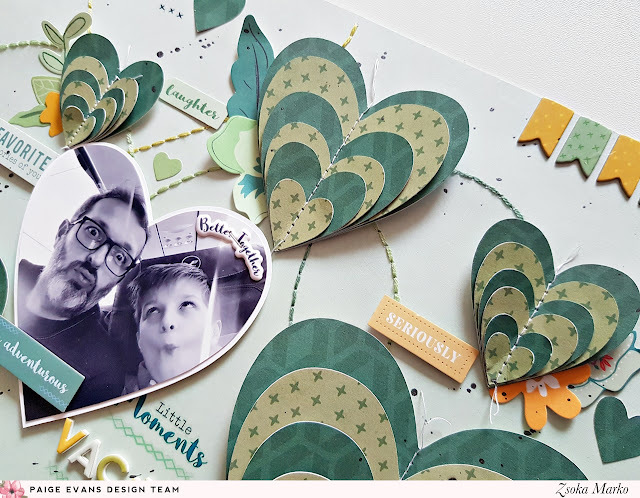 I die cut a scallop rectangle from patterned paper for my background. I also attached a piece of red scallop sticker at the bottom. 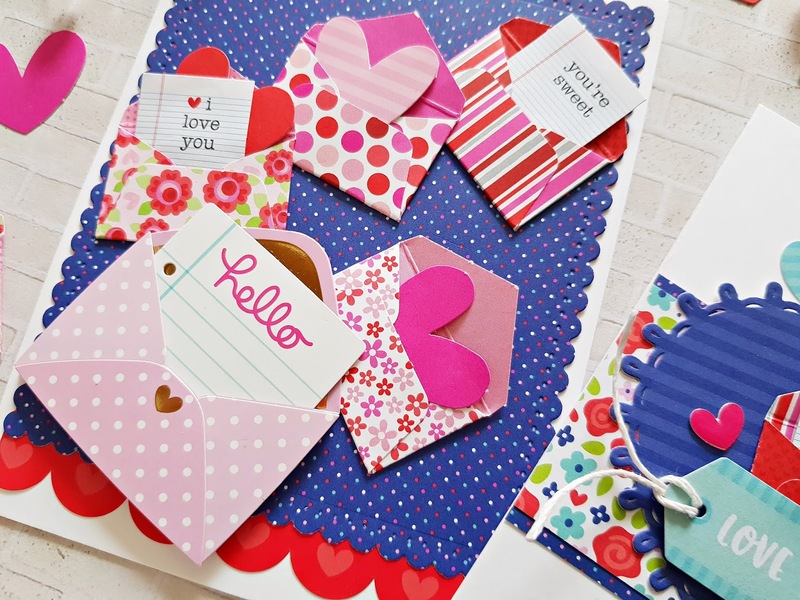 I then arranged the envelopes the way I liked them and glued them down. I filled some with a note, some with hearts (also included in the mini envelope pack). I added a few strips of patterned papers and stickers to the white card base, then die cut a big heart from blue patterned paper (I used the 6x6 paper pad for my cards). 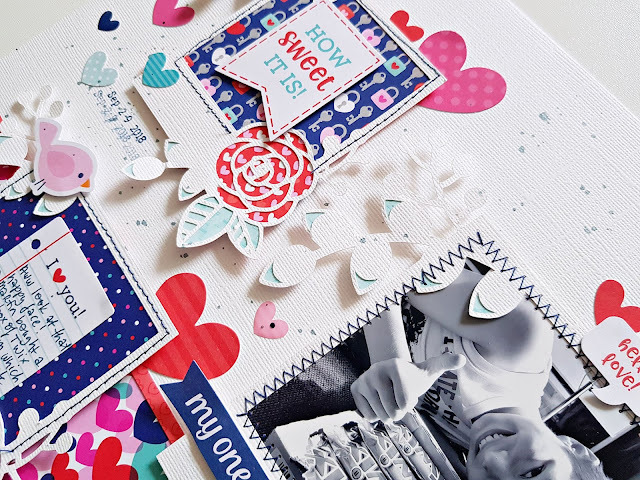 I glued a mini envelope on top and scattered some die cut and enamel sticker hearts all around. 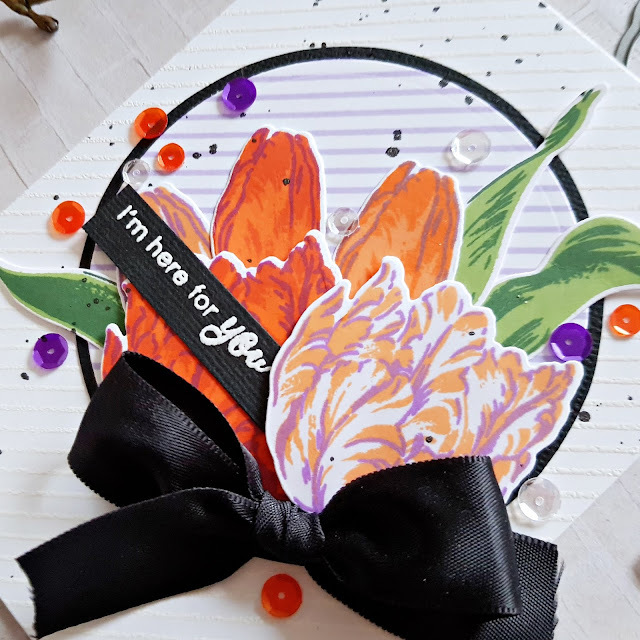 For the sentiment I used a die cut tag which I added to the card on pop dots. 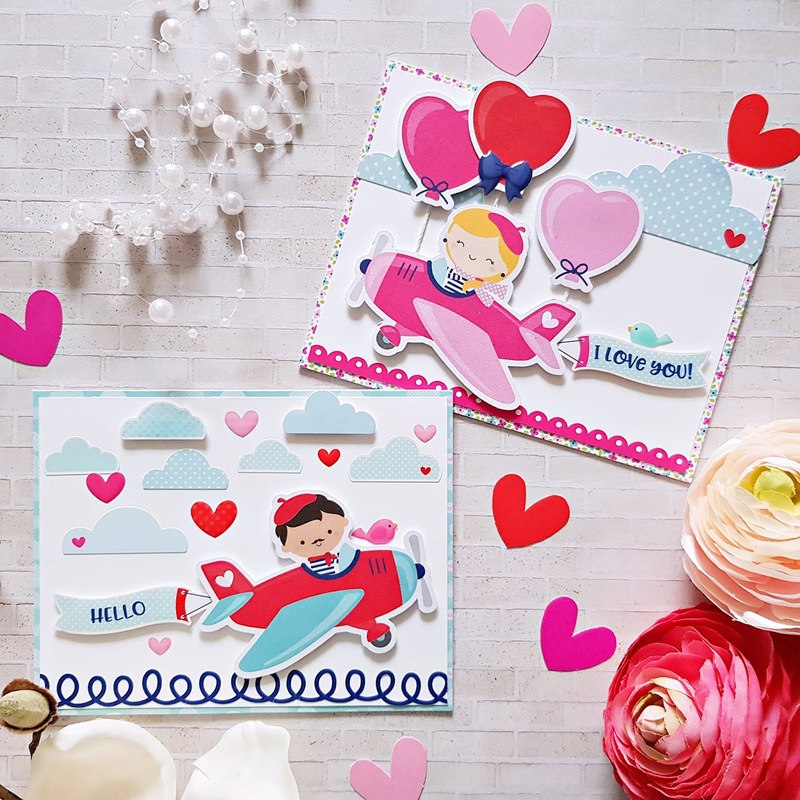 I just had to use the adorable kids flying airplanes on my last two cards! 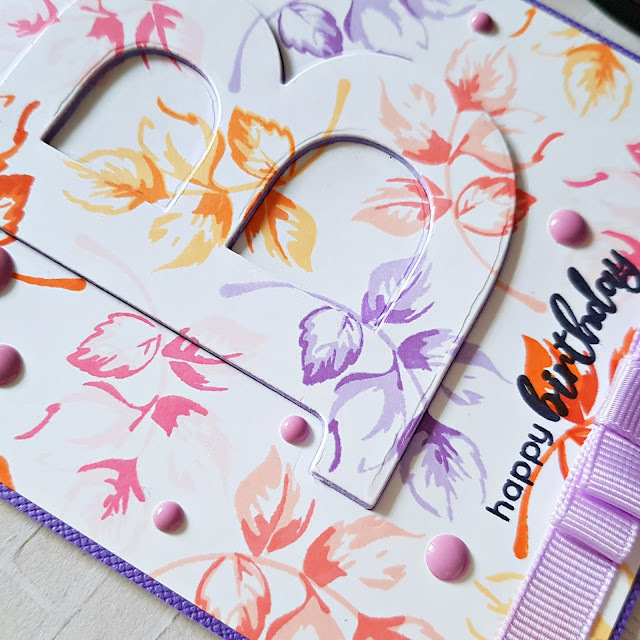 I created two A2 size top folding card bases (landscape), attached some patterned paper on top, then added a slightly smaller piece of white card stock too. 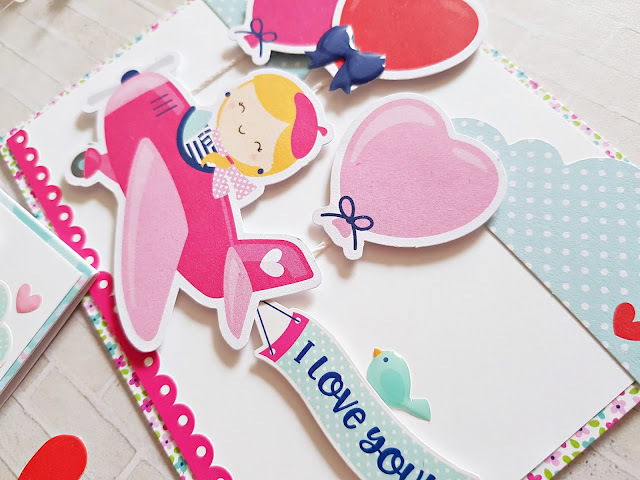 I pulled out all clouds I could find - die cuts and stickers. I used two big ones on the girl card, as well as some heart balloons. I added foam adhesive to the balloons and the plane/banner for a more dimensional look. 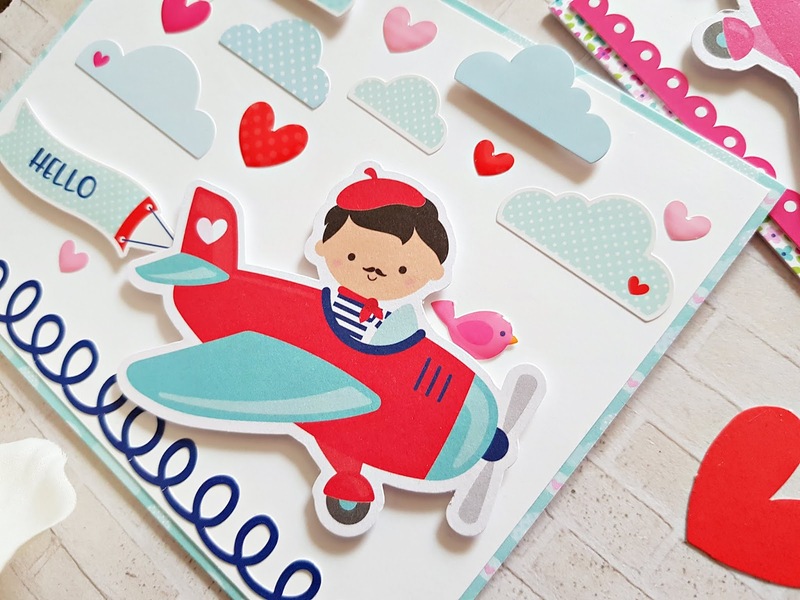 A cute enamel birdie and bow finish off this card. For my boy card I used a lot more clouds - some of which I placed on pop dots. The plane and the banner are also attached with foam adhesive. I scattered some enamel hearts in between the clouds. Oh and the boy is also accompanied by a little enamel bird! Last but not least I added some border stickers at the bottom of both cards. That's it! 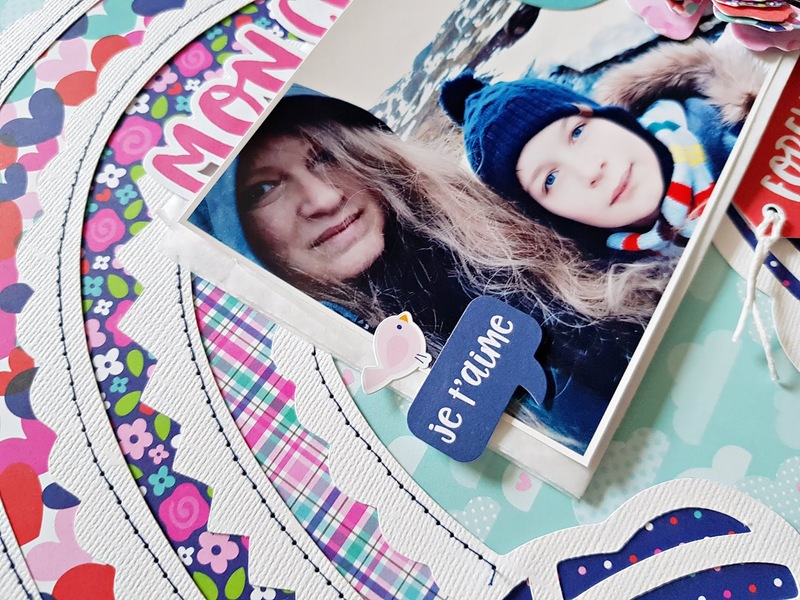 I hope you enjoyed my projects as much as I enjoyed creating them! A big thank you to Doodlebug for having me! And thank you all for stopping by today! Have an amazing day! 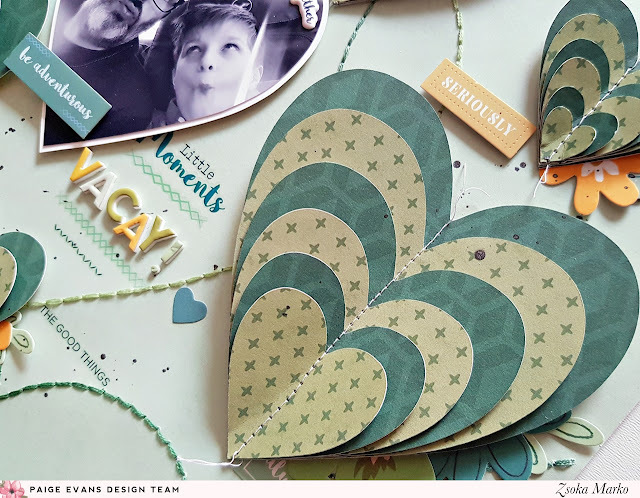 I'm back today with two new layouts for the Paige Evans Design Team. Two layouts that are pretty much the same but they will go in different albums so I don't mind. I wanted to do some layered hearts again, but this time with some stitched hearts in the background. 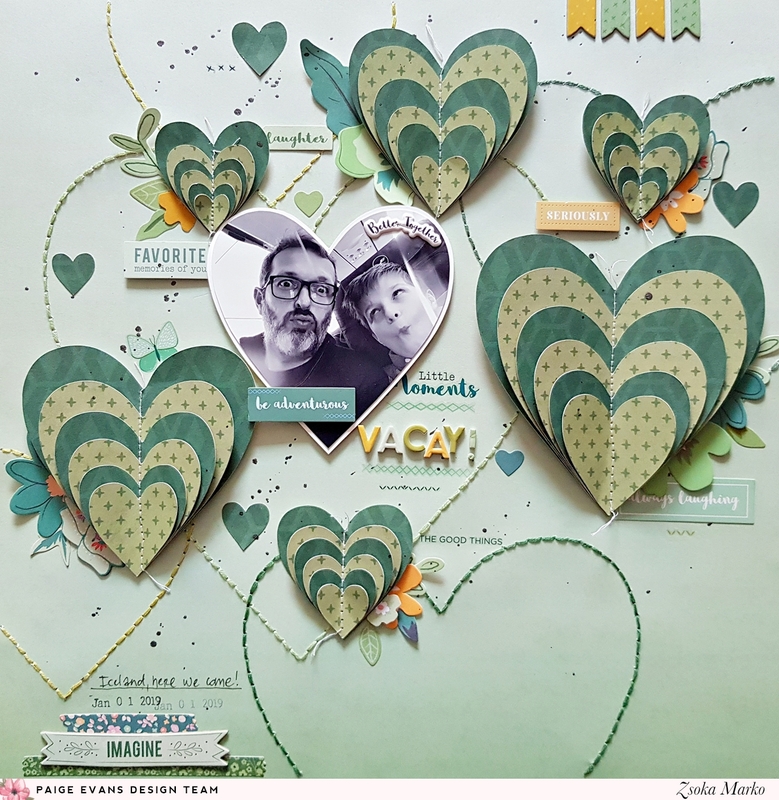 I could not decide on the color scheme...First I sketched the hearts on a pink background, then I changed my mind and thought I'd go green monochromatic. So I sketched the design on a green paper. But then I changed my mind agin, thinking I wanted something colorful, so I sketched the design on a yellow paper too. That's 3 papers already and I still wasn't sure haha! So I decided to go for two, the green monochromatic and the colorful one, I wasn't going to waste 3 good papers! 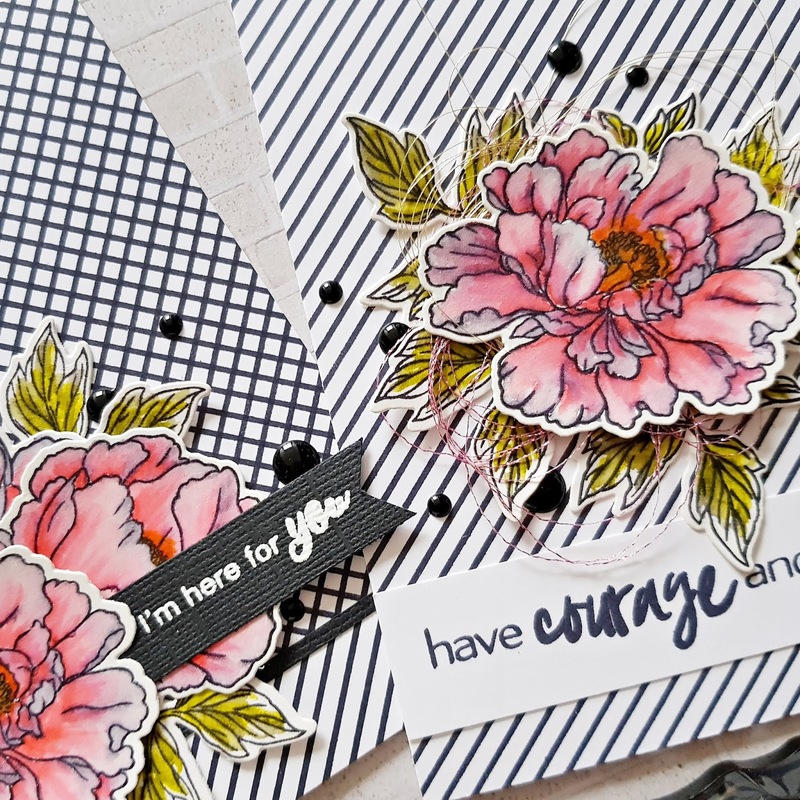 As I mentioned, I started out by sketching the background design on the patterned papers - I used my Silhouette Cameo and sketch pens for this. I then selected a few different embroidery flosses and hand stitched the background. Nothing fancy, so this was actually not a lengthy process. 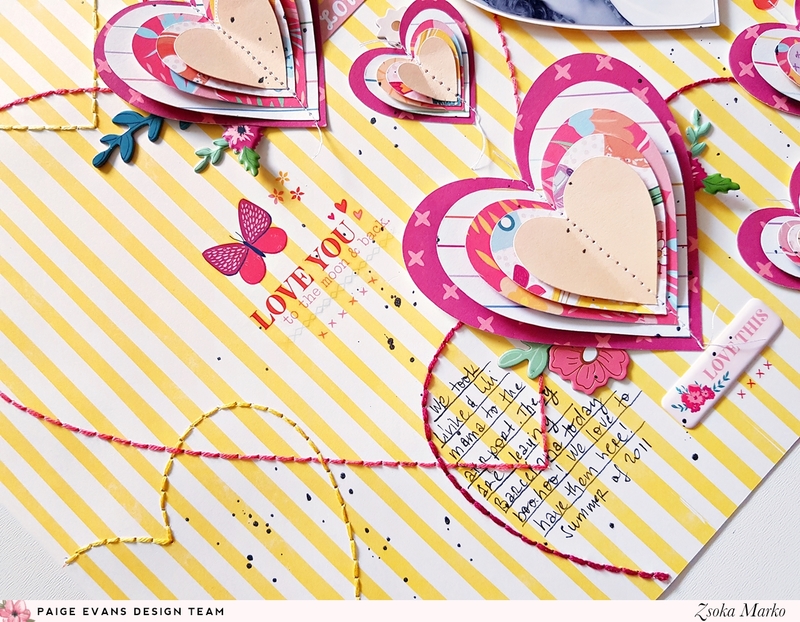 I then cut a bunch of hearts in various sizes from different patterned papers. I slightly glued the layers together, just so they don't move while I run my sewing machine over them. I arranged them on my background and once I liked the placing, I glued them down. 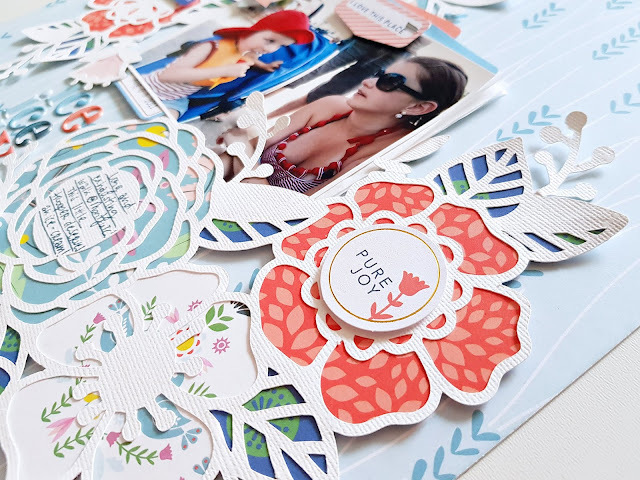 I went through all embellies and pulled out the ones I thought would work: die cut flowers, chipboards, puffy stickers, cardstock stickers, and my most favorite: rub-ons. 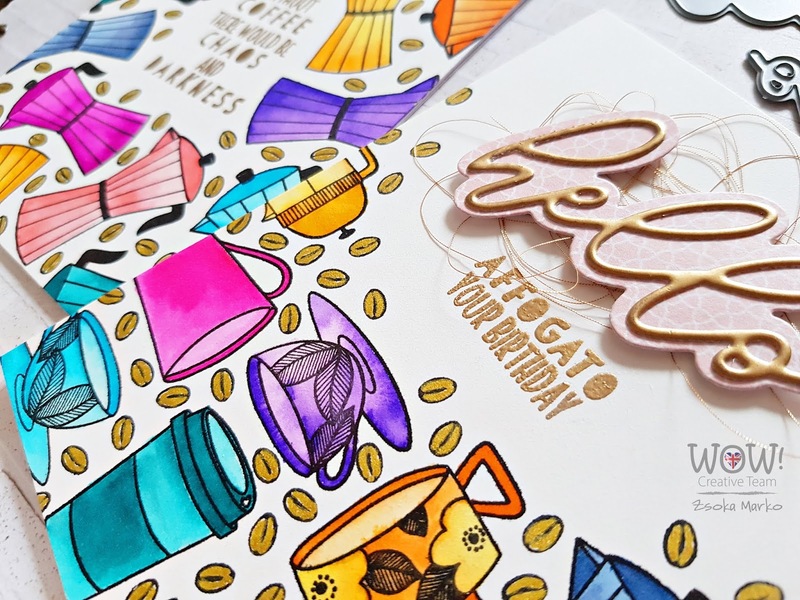 I love the colorful rub-ons in Paige's collections, they are always such a great finishing touch to any page. They are great quality too! 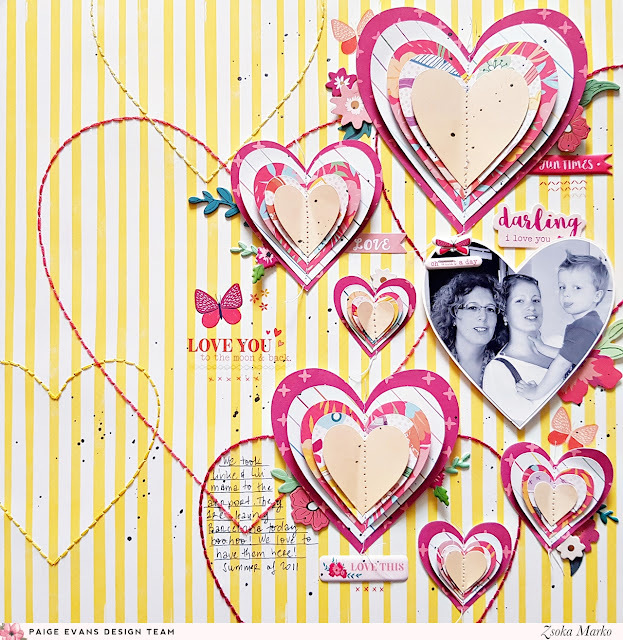 I scattered the chosen embellishments around my pages; some I tucked behind the hearts, others I popped up - all just to add some dimension and interest to my layouts. To finish them off, I wrote my journaling, stamped my date and added some black ink splatters. Et voila! Done! I hope you liked today's inspirations! Thank you so much for stopping by today! Have a wonderful day! Hi there friends and welcome to the WOW! 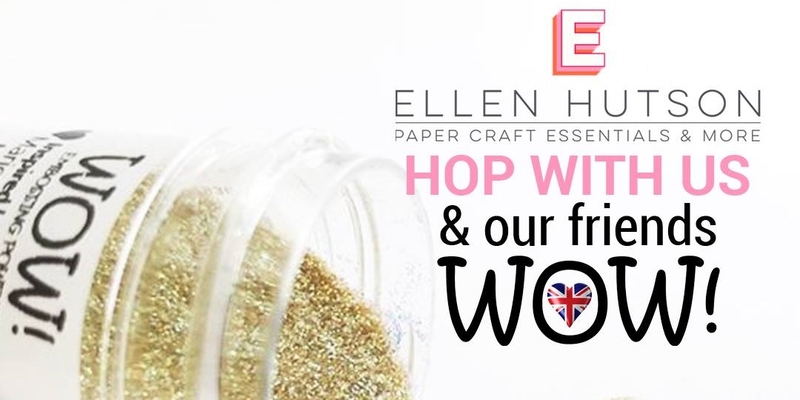 Embossing Powder and Ellen Hutson collaboration blog hop! You should have arrived here from the wonderful Ardyth's blog! I've never had stamps from Ellen Hutson before so I was very excited to play along! 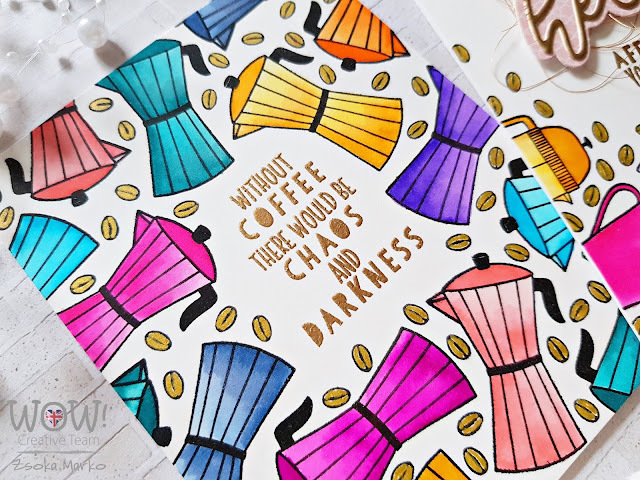 I also haven't made a coffee themed card before if you can believe it! I only like espresso but I very rarely drink it because for some reason my body doesn't process it well. But I definitely wanted to use some of the coffee stamps from the February release because there so many cute images! First up, I used the Breve Note stamp set - I love all the little mugs, pots and espresso machines! And the font of the sentiments is so awesome! 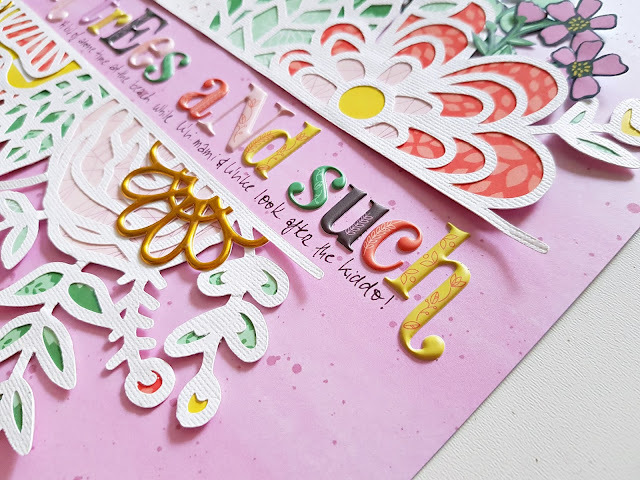 So I first stamped the sentiment (left card) in WOW embossing ink on an A2 size watercolor paper panel, then embossed it with Metallic Gold Rich Pale embossing powder. I then stamped the images around the sentiment in black Versafine ink. I colored them in using water colors. I stamped some coffee beans all over the panel, to fill up the white space and colored them in with a metallic gold pen. I added the panel to a top folding A2 size card base and done. The card on the right is the same thing, I just didn't fill up the whole background, and I went with a more linear placement of the images. I also used the Big Scripty Hello die set to create part of my sentiment. 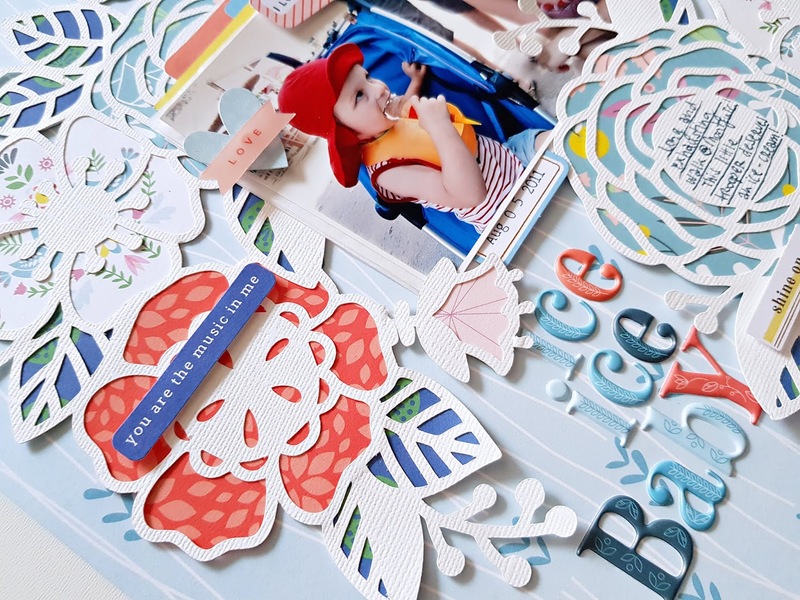 The skinny Hello die cut is embossed with the same gold powder 2 or 3 times. 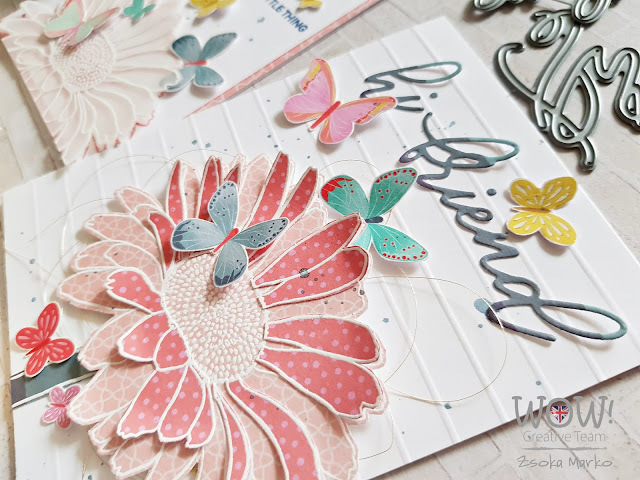 On my second set of cards I've used the Mondo Gerbera Daisy stamp and die combo. On the card on the left I first stamped and embossed the flower with the Hot Gossip embossing glitter. 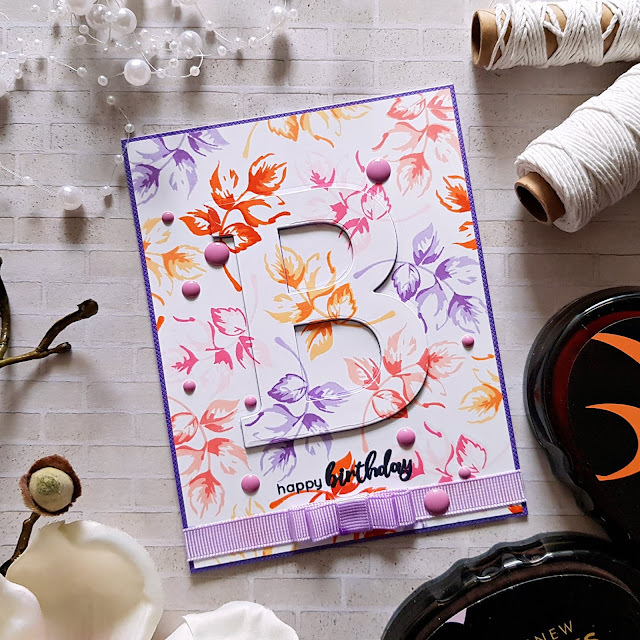 I then stamped the same image on vellum and embossed it with Opaque Bright White embossing powder. I attached the vellum piece to the pink one, slightly offset, so I can see some of the color peeking through. 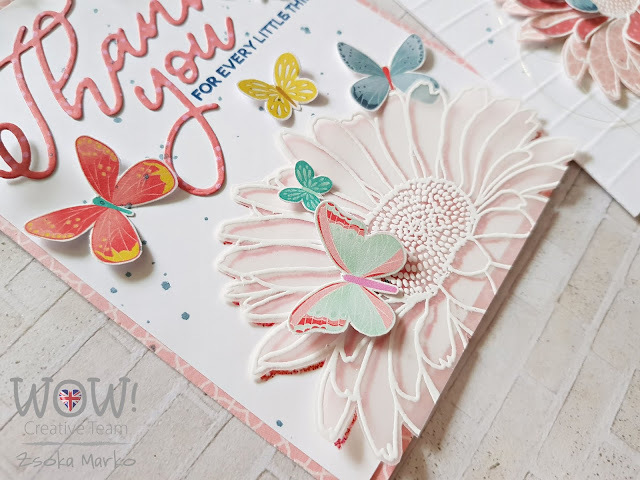 I die cut Thank You from a pink patterned paper, using the Big Scripty Thank You die set and stamped a sentiment below it, which you will find in the Mondo Gerbera Daisy stamp set. To finish off this card I splattered some navy ink around the panel and added some fussy cut butterflies. On my second card I wanted to do paper piecing, so I stamped and embossed the necessary images on different patterned papers. I wanted to create a more dimensional flower, so I added a few petals in a darker shade of pink. To add interest to my white background, I used a bone folder and a scoring board to add embossed lines. 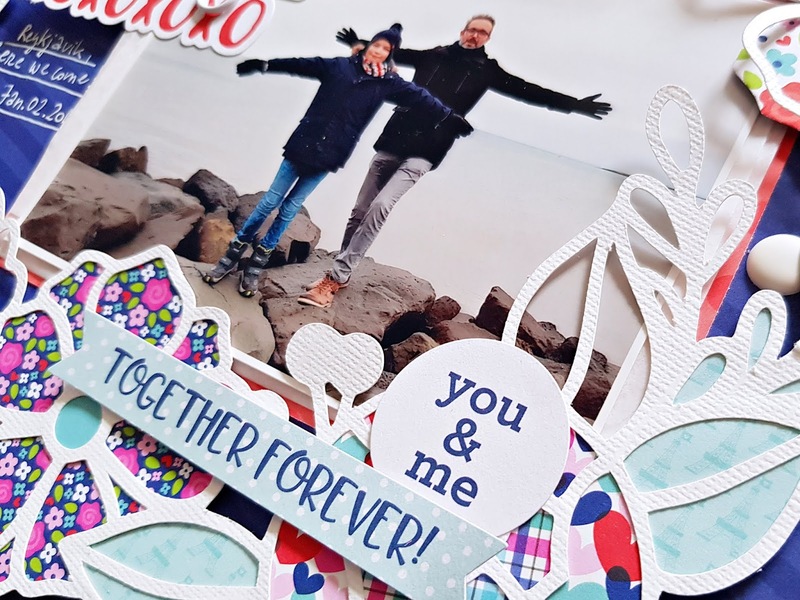 Again some navy splatters, fussy cut butterflies and a friendly die cut sentiment finish off this card. 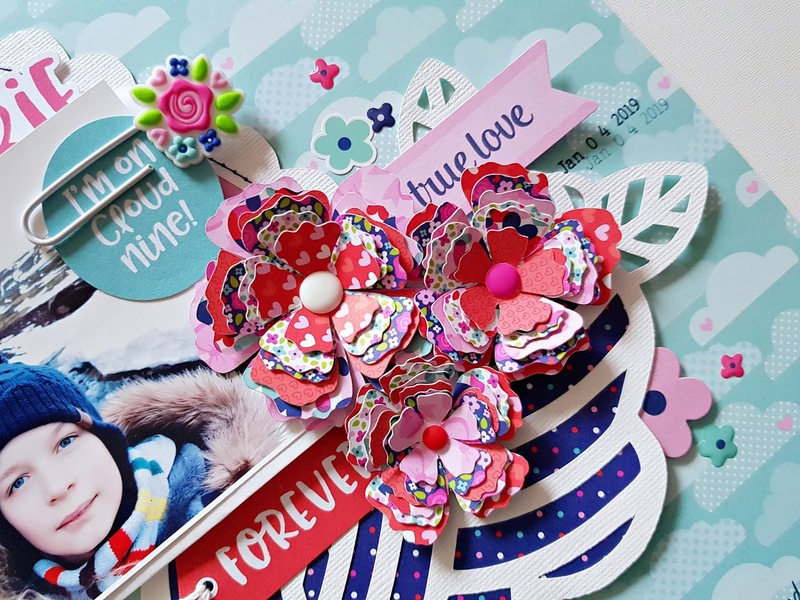 The Hi Friend die is part of the Mondo Gerbera Daisy die set! Now for the fun part! 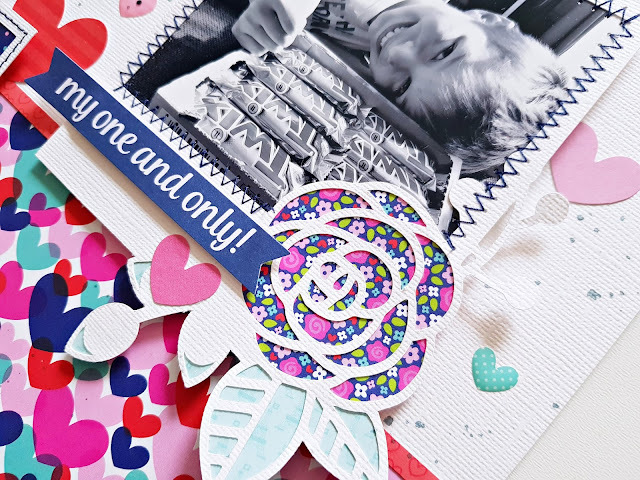 Of course there is no blog hop without a giveaway! One lucky crafter will win 6 WOW embossing powders of their choosing, a carrying case and $25 to the Ellen Hutson shop! To enter the giveaway, just comment at each stop on the hop (it's only a few stops!). A winner will be randomly drawn on February 25th and contacted by email. Good luck you guys! Your next stop is Adelina Starace! Zsoka Marko ------ YOU ARE HERE! The wonderful Altenew February release is here! 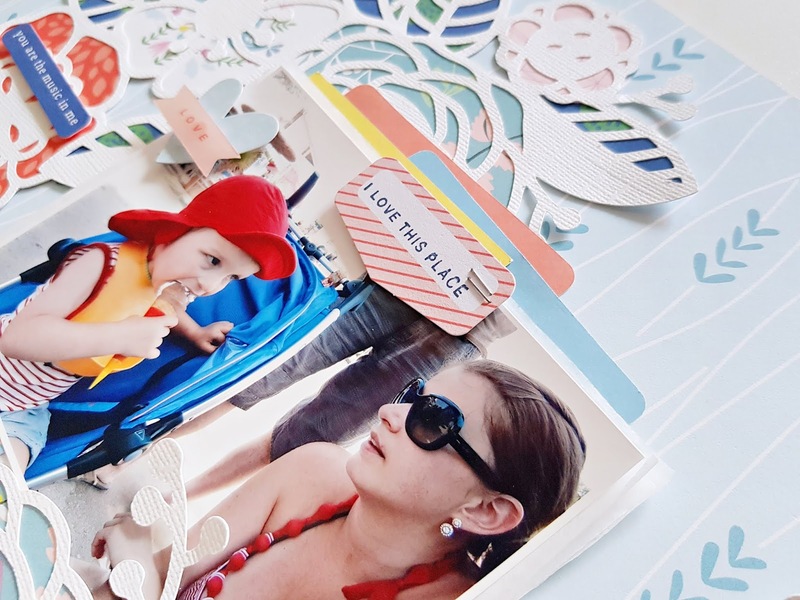 You should have arrived here from the amazing Lydia Evans' blog! I can't wait to see what beauties she created for today's post! I'm going to keep this post short, because I've made quite a few projects again, so there's lots of photos! I hope you guys don't mind... If you have any questions on how I made something, please don't hesitate to ask! I didn't think I'd make my favorite cards with the smallest stamp set in this release! 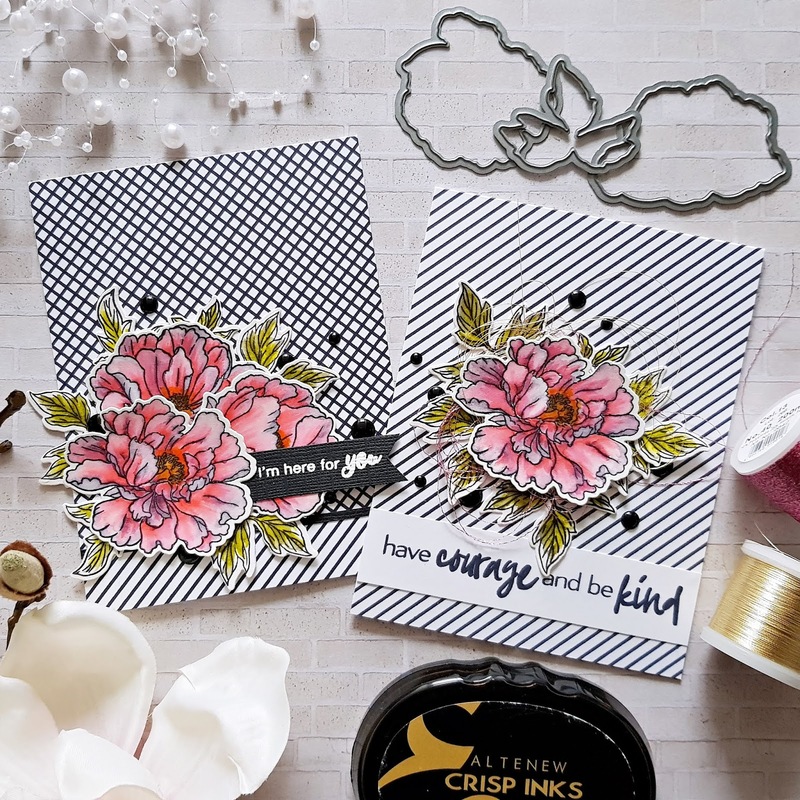 The Vintage Roses Add-On stamp set, as its name suggests, works with the Vintage Roses stamp set. I think it totally works on it own too, what do you think? I also used the Mega Alphabet B die on this card. Next up, two cards with the Beautiful Peony stamp and die sets (also available as a bundle). The striped and grid backgrounds I've created with the Pinstripe stamp set. 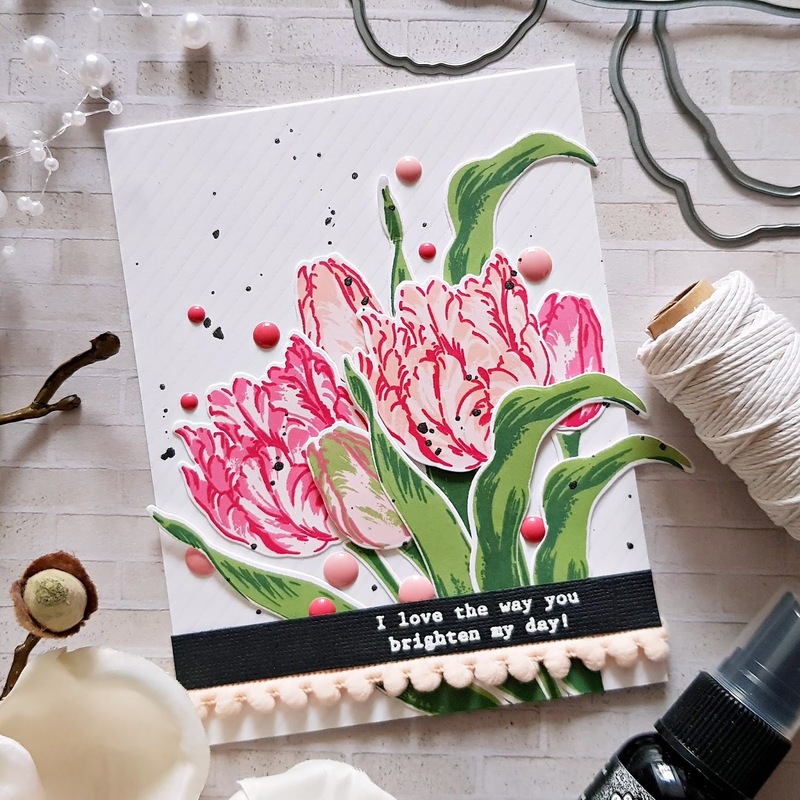 Tulips have been one of my favorite flowers since my childhood! My sweet late grandma had many in her garden and she would bring me a big bouquet for my birthday each year. My birthday is beginning of May, back then we still had tulips that time. Now they are gone in April. Global warming I guess :(. 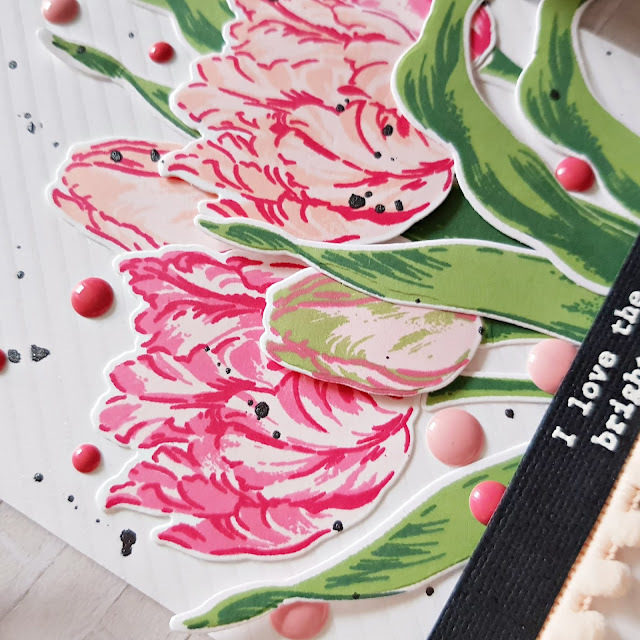 Long story short, I obviously had to have the Exotic Tulips stamp and die sets (also available as a bundle)! 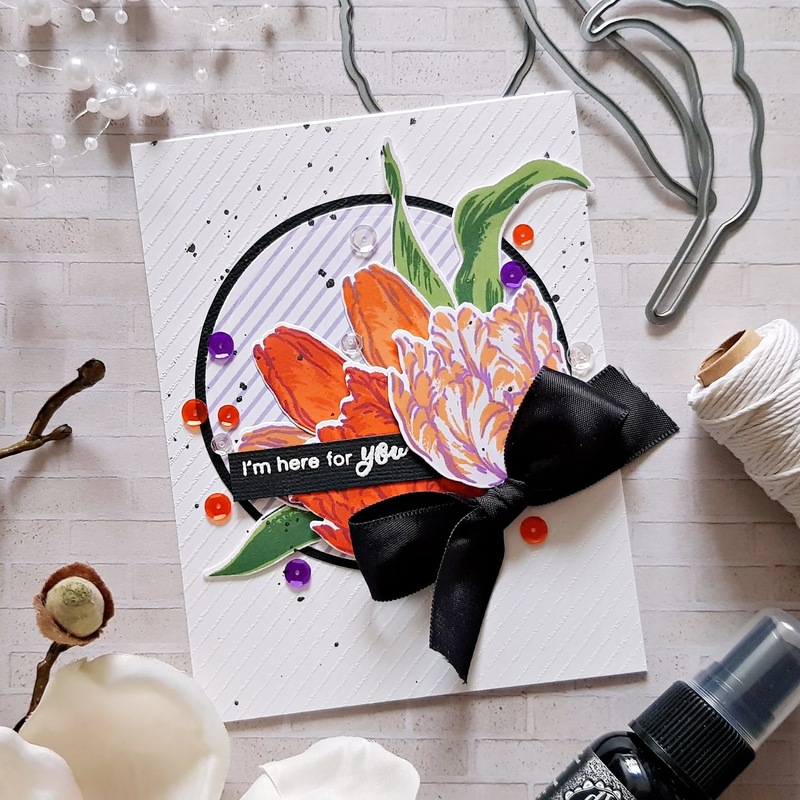 For the sentiment on the first card I used the Better Together stamp set. 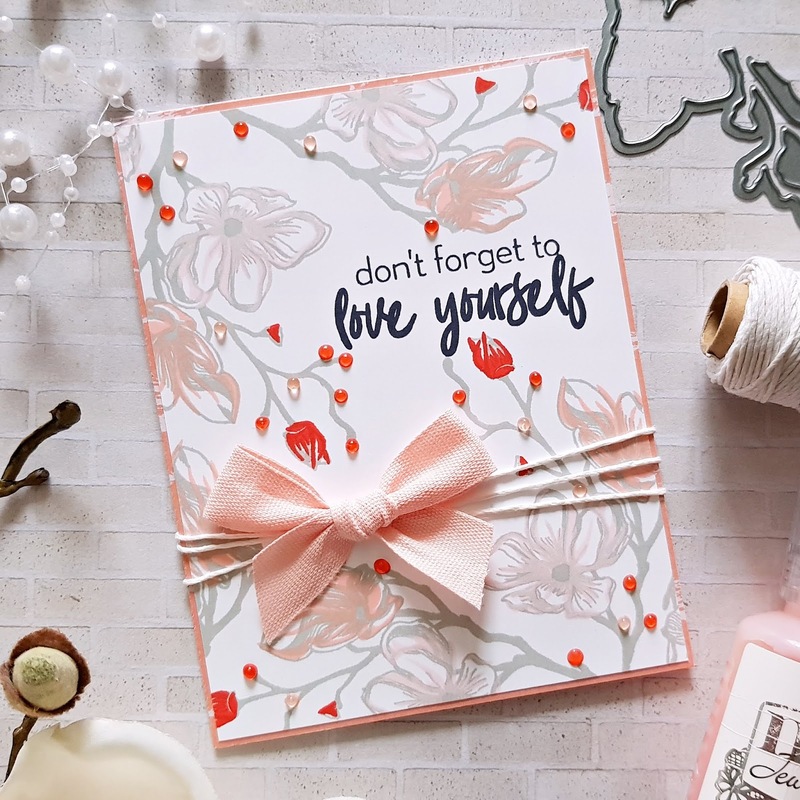 Last but not least I have a card with the Dotted Blooms stamp and die sets (available as a bundle too). I hope you've found something here today that inspires you! And now the fun part...Giveaways, yay! Read on to find out how you can win! Good Luck! 1. To celebrate this release, Altenew is giving away a $50 gift certificate to 6 lucky winners! Please leave a comment on the Altenew Card blog and/or Altenew Scrapbook blog by 02/21/2019 for a chance to win. 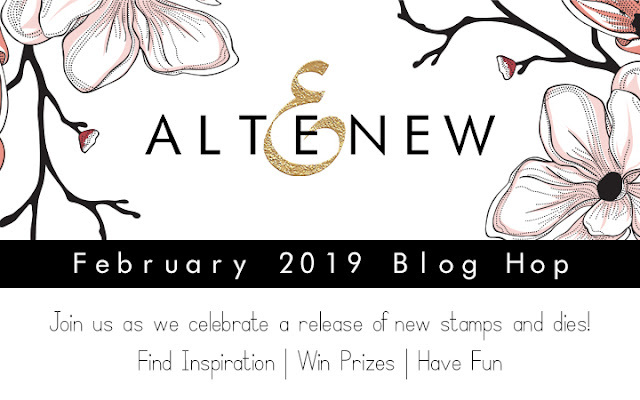 6 winners will be announced on the Altenew blogs on 02/24/2019! 2. I will also draw a winner to receive a $30 gift certificate! I will announce the winner on 02/21/2019. Comment away!!! Of course I'm inspired. 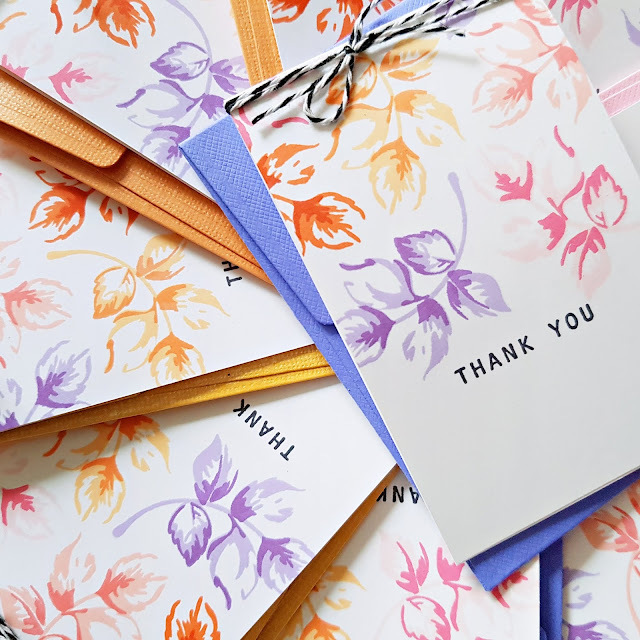 Your work is beautiful--so many beautiful cards. 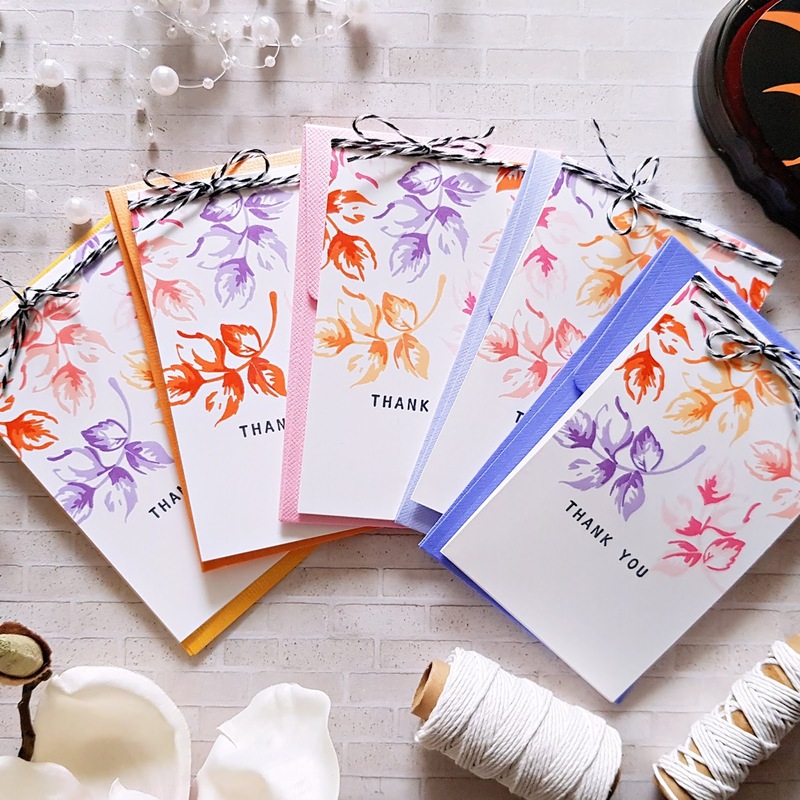 I love those thank you cards. What a great idea! Your tulips are beautiful, too. I remember my grandma's tulips also. They were always planted in perfect straight rows and looked like beautiful, colorful soldiers. Sigh..hurry spring! Thanks so much for stopping by today! I hope I could inspire you in some small way! Your next stop is Joni Andaya! Zsoka Marko. ------ YOU ARE HERE!